I’m not a backpacker but sometimes love to carry a lightweight and stylish backpack for travel. The main benefit of using a lightweight travel bag is this can be changed to be used as a stylish handbag, shoulder bag, and sometimes a messenger bag and sling bag as well. I love my black colored leather backpack (Featured Image) from Sreeleathers in Kolkata. This stylish backpack perfectly goes as a handbag as well as a shoulder bag. And for another reason, I love stylish backpack which can be used to carry whole day outdoor activities or day trip. At least I don’t have to take the heavyweight bag for the entire day. 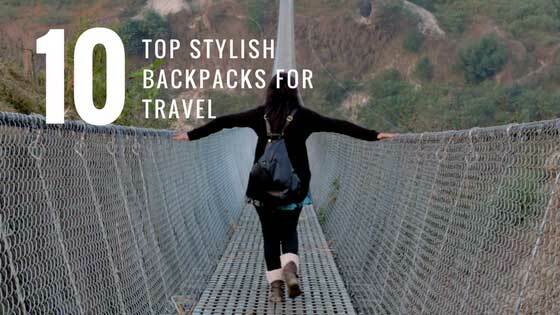 So here I’m listing 10 top stylish backpacks for travel these are at the same time comfy and multifunctional. The following listed stylish backpacks are available in various ranges to fit your budget, style, and comfort. Moreover, all of them can use for multi purposes. You can also select the following backpacks for daily use when you’re not traveling. Some of them are perfect to use as a carry-on bag for a short trip. 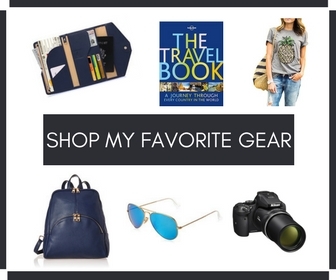 You might also love to choose any of them as a travel gift for your friends and fellow travelers. 3 Click To Save Lightweight & Stylish Backpacks! 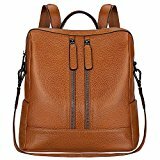 BOYATU Women Leather Backpack is one of the best fashionable travel backpacks which offers large capacity and the weight is just 1.65 – 2.2 pounds. This multifunctional travel backpack can use as a laptop bag, sling bag, handbag, messenger bag, and even school shoulder bag. The stylish handmade design travel bag is soft and comfy and also available in different colors. You can carry a lot of your travel accessories as contains several pockets. 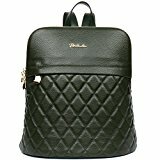 You can use this stylish and best backpack for work and travel or just for shopping. This backpack can also be a cute travel gift for your stylish fellow traveler. UTO Women Backpack is too stylish and super comfy. The weight is 1.96 pounds and also perfectly fit to use as shoulder bag and handbag. The ultra soft washed leather backpack also got large capacity with several pockets. You can easily keep your essential travel resources to smart gadgets like iPad, smartphone, tablet and 10″ laptop. This stylish backpack is also available in black color. S-ZONE Lightweight Women Genuine Leather Backpack is perfect for a day trip as weight is just 1.54 pounds and makes you feel super comfy and light. This travel bag can also be casually used as a shoulder bag while traveling around. There are many zipper pockets but too smooth to handle. The leather material is soft and got maximum durability. You can carry your lightweight travel essentials like wallet, smartphone, iPad and a water bottle or other beauty items. The lightweight backpack is also available in several colors. ELOMBR Women’s Backpack is a smart travel bag to carry your essential items as well as suitable for student travelers. The washed leather backpack is waterproof, and weight is just 1.45 pounds and can also casually use as a shoulder bag. This also got large capacity with many pockets to carry a lot of things. If not traveling you can use this stylish backpack for daily use like shopping, working. There is also one hidden zip pocket and available in several colors to select your favorite one. 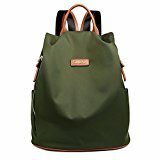 Canvas Backpack Purse Travel is just fit for student travelers as well as lightweight backpackers. You can use this backpack for any outdoor trip which is water resistant and will protect your travel essentials not to be wet. The weight of this stylish travel bag is 1.69 pounds and comes with several smart design and size. There are several pockets and also durable. 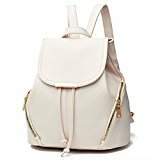 Shomico Women’s Backpack Purse is a small and stylish travel backpack but perfectly fit enough to carry many smart travel essentials. This vegan faux-leather backpack is also available in various colors and design. Also suitable to be used as a shoulder bag as well as a school bag. The fashion travel bag made of high-quality material and durable. TOPSHINE Women Backpack Purse is a multifunctional and water resistant travel bag. There are three different options to carry this stylish backpack as a shoulder bag and also handbag. The weight is 1.8 pounds and also available in blue color. The large capacity with several pockets will help you to carry your travel essentials and also suitable for daily use. 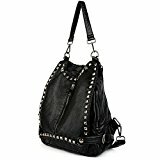 Z-joyee Casual Purse Fashion Backpack is a trendy one to carry for various ages of girls and women travelers. You can use this bag as a shoulder bag and also the best backpack for city travel. Though mini backpack but roomy enough to fit your essential daily items and mini gadgets. This stylish backpack is made of PU leather and available in various cute design and colors. UTO Women Backpack Purse is another super stylish and durable waterproof travel bag. I love the design of this brand. The weight is 2.12 pounds and also looks smart to be used as a shoulder bag and handbag. The ultra soft synthetic washed leather backpack also got large capacity with several pockets. You can easily keep your essential travel resources to smart gadgets like iPad Mini, smartphone, Kindle and 12″ laptop. This stylish backpack is also available in various colors. 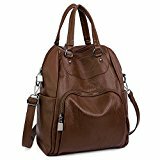 BOSTANTEN Casual Leather Backpack is the stylish one for various ages of girls and women. The high-quality material of this medium size bag gives a luxury, delicate and professional feel. You can carry your daily essentials and light travel items for traveling and working. 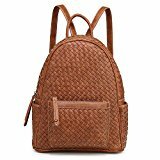 The stylish handmade design fashion backpack is also suitable to use as a shoulder school bag and available in various colors and design to buy. 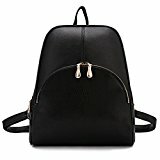 Looking for some more collection of fashionable backpacks? 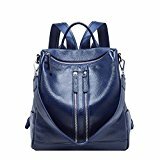 Check out my Amazon page for the more stylish backpacks that suit your budget and style. Click To Save Lightweight & Stylish Backpacks! Do you love to carry a stylish backpack while traveling? 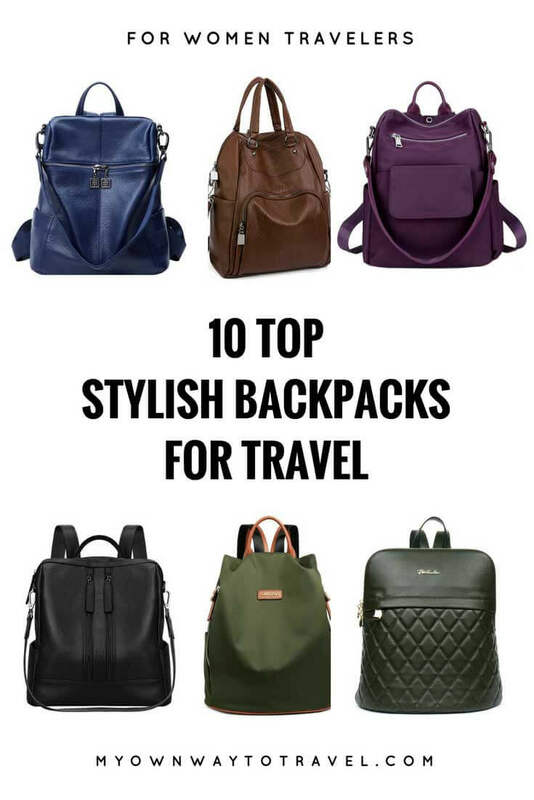 Tell me your pick from the listed 10 top stylish backpacks for travel. That’s great to hear 🙂 They got really many nice designs. My sister loves backpack so will this with her. The Elombr and Z-joyee backpack look stylish though. For a girls trip to Thailand, my friend bought a bag similar to the Canvas Backpack Purse Travel. It was so lightweight and waterproof, which was definitely a bonus since we were at the beach majority of the time there! I’ll consider these bags when looking for travel gifts! Thanks! Topshine for me please 🙂 Thanks for the details, useful post when you are struggling with the backpacks! These are all so cute! I think my fave is the Elombr one especially since it’s waterproof. The Canvas Backpack Purse Travel one seems like a great choice too considering its lightweight perks! I’m more of a purse girl myself, but I do like the looks of that S-ZONE bag with the two zippers! You have picked so many cute styles in here. The colors are awesome too. I am not a big fan of backpacks. I find it difficult to move them to the front part of my body when I need something. I travel with a sturdy crossbody bag. Sometimes I also find it difficult 🙂 The listed UTO Women Backpack Purse PU is also perfect to use as a crossbody bag. I do like having a day bag for exploring on holidays. I really like that final one the Bostanten bag…I can see that being really useful. I’ve been on the fence for ages deciding whether I should purchase a stylish backpack for travel. Practicality has always won, but I’m desperate to get something stylish in the future. Great suggestions! Especially love the canvas bag. Love this post! I was looking for a new backpack! I guess the ELOMBR Women’s Backpack Purse will be perfect for me. thanks for sharing this idea. I’m looking for a bag like this — a stylish backpack — that I can use for my camera and other “must carry” items when I travel. Thanks for doing all of the research for me. Now I just have to pick one! Great to know and some of them are really fit as Carry On Bag. I am not a backpacker myself, but I would love to have the Canvas backpack with me when I travel. Its stylish and waterproof. I love that too, cool one! Great, thanks for the info. I currently found a foldable backpack from and in-flight catalog and I love it.